The window bay is a popular architectural detail in cities, as it allows precious natural light to fill front rooms on narrow streets. With its elegant brick town houses, brass door knockers, decorative ironwork, and gaslit narrow streets, Boston’s Beacon Hill is the oldest historic district in Massachusetts. In 1962, the aristocratic neighborhood was designated a National Historic Landmark. The Beacon Hill Architectural Commission strictly regulates changes to any visible part of a structure, so visitors to this half-mile square enclave experience something of a time warp. Hiking up the steep brick sidewalk from shop-lined Charles Street to residential Pinckney Street, it’s easy to imagine Louisa May Alcott perched on the front stoop of #81, where she moved in 1880. The ghosts of former residents Henry David Thoreau, Henry James, and William Dean Howells still haunt the neighborhood where current denizens include Senator John Kerry and his wife, Teresa Heinz. 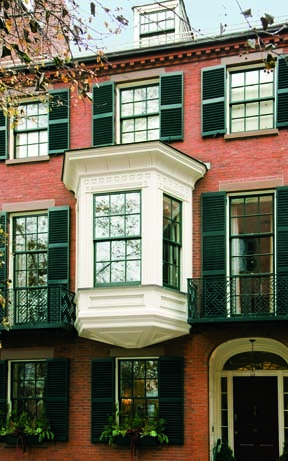 When architect Sally DeGan of SpaceCraft Architecture in Lexington, Massachusetts, undertook the rehabbing of a five-story Federal town house not far from Alcott’s onetime home, the conundrum she faced could have been right out of Little Men: How to accommodate a family with five active boys and two dogs in little more than half the space they were used to living in? 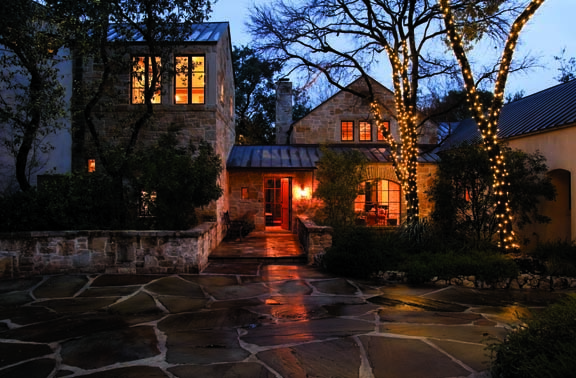 “The house had to be homey and comfortable,” DeGan says, “because they occupy every inch of it.” The architect’s challenge was to render an overall impression of the late 1800s, when the home was built, without compromising her passion for living spaces that welcome, comfort, delight, and inspire, all of which matched items on her clients’ wish list. The 3,885 square feet of living space, from basement playroom to attic sleeping quarters, comfortably and efficiently accommodates the family members, who, in addition to being musically inclined, are athletic and love to entertain their large extended family. There are five bedrooms, five full baths, and one half bath. 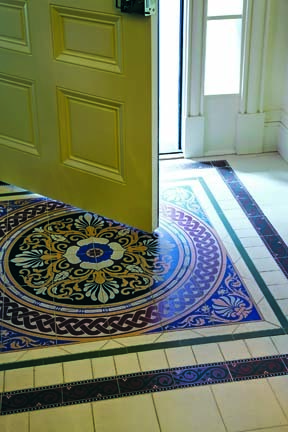 DeGan designed the interior moldings in this entryway, following details and proportions of nineteenth-century row houses in Beacon Hill. “Given the narrow footprint and the challenging light conditions, we opened up rooms and connected spaces for multi-purpose living,” says DeGan. The homeowners wanted to add more bedrooms, but their first priority was the ground-floor space, which includes the kitchen, dining room, living room, laundry room, and a courtyard. In the kitchen, an existing steel beam was raised to increase the ceiling height to about nine feet. The coffered ceiling that now hides the beam exemplifies DeGan’s mastery of achieving harmony and balanced proportions throughout the house. For this and other trim work—moldings, wainscoting, mantelpieces—she tried to give the homeowners something of a sense of the house they had left as well as the feeling of a formal Beacon Hill home—the flavor of the 1800s, as in the Federal-style symmetry, if not a literal translation. Sunlight pours into the cheery kitchen through three skylights—one new addition and two existing but replaced. A row of windows looks out on a newly painted brick wall that brings the outdoors in. Artist Jan Marie Spenard’s trompe l’oeil mural depicts the view from the front porch of a longtime family camp on Lake George. When it rains, the special crushed-mineral paint (which actually helps preserve the brick) creates a striking, jewel-like effect. DeGan’s attention to form and function produced numerous new storage areas. “We design homes with a purpose for every space,” she says. “It’s amazing how much we struggled for a few inches here, a foot there.” Closets are built into the sides of archways, built-ins replace bureaus in the bedrooms, cabinets hide behind wall paneling, and window seats lift up to stash items underneath. Form and function was carried through by the builder, Silva Brothers Construction, who happens to be general contractor for PBS’s “This Old House.” They added whimsical touches like swings in the basement playroom and a zip line and climbing wall in the younger boys’ attic bedroom, where space under the eaves was reclaimed for a row of drawers, each deep enough to hold a good-sized suitcase. The only original architectural elements left untouched were Indian shutters on some of the windows and a niche in the wall at the top of the stairs. The staircase and banister are original to the home, but the sagging stairs had to be reattached to the wall. (Rebuilding them to code would have eaten up precious floor area.) There is new stained quartersawn oak flooring and radiant heat throughout the house, and several of the bathrooms have black-and-white basketweave Carrara marble floor tiles, a traditional pattern the homeowners are fond of. 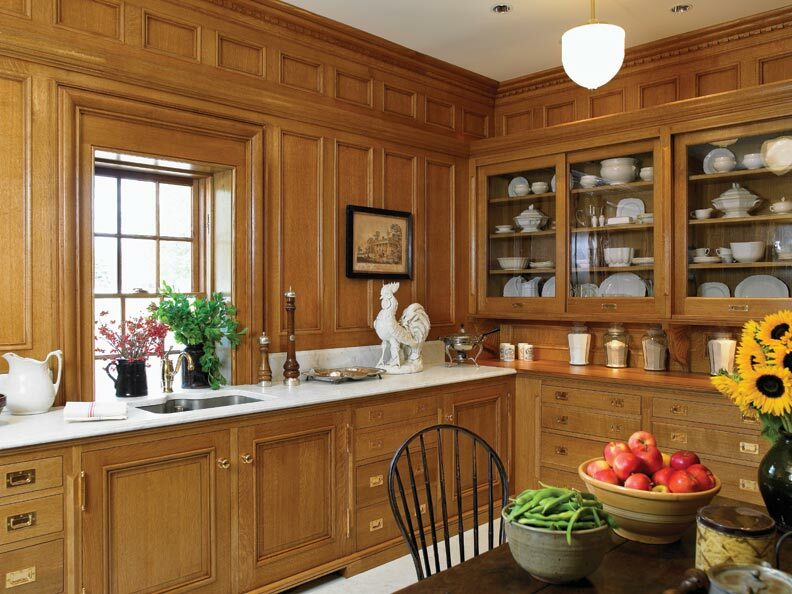 Kitchen cabinetry resembles storage from the late nineteenth century. Along with putting a premium on sunlight, the homeowners had strong feelings about the interior decoration. “Not too masculine, and not too frou-frou,” were the guidelines. “I didn’t want it to be too Louis XIV, but I wanted it to be evocative of the times,” DeGan says. The result is a pleasing combination of classic Federal-style elements, like semicircular fanlights and marble firebox surrounds, with furnishings from the family’s previous home that range from an orange leather couch in the kitchen to a Steinway grand piano in the second-floor parlor. The interior design incorporates a number of Federal arches, a style the homeowner admires. In fact it was she who did all the decorating, scouring E.R. 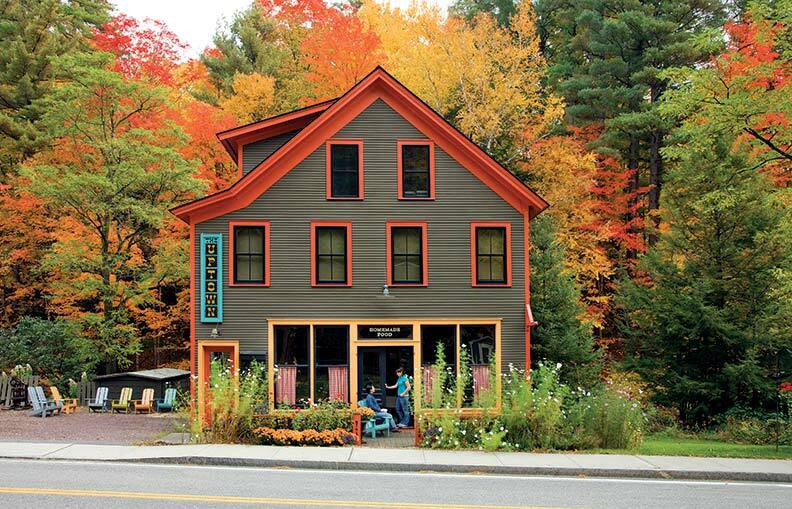 Butler and other Charles Street antiques shops for period light fixtures, ordering Victorian floor tile from England for the front foyer and the mudroom, and finding just the right placements for the family’s eclectic art collection. The doors to the dining room are carved Chinese screens that the homeowners purchased as newlyweds and have brought with them over the years from home to home, and sometimes country to country. With the exception of the ground-floor hallway and stairwell walls, which sport a predominantly yellow Brunschwig & Fils garden-theme wall covering, every finish is hand-painted. Decorative painter Ruthann Pordes chose a golden base color from her stencil work in the dining room and carried it through all the rooms. Complementing this predominantly yellow color palette are other classic Federal-era hues like sky blue, cream, celadon, and rosy peach. Janice Rohlfis a freelance writer living on Cape Cod.